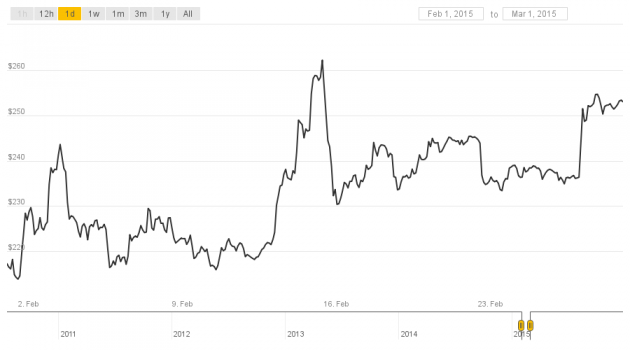 After a year filled with its share of doom and gloom, the verdict is in: Bitcoin won 2015. As trumpeted by headlines in CNBC and Bloomberg, bitcoin was the best-performing currency of the year, netting near-40% gains, more than double its nearest competition, the Somali Shilling and Gambian Dalasi. The development contrasts with bitcoin’s performance from 2014, in which it lost 56% of its value, the most among global currencies. 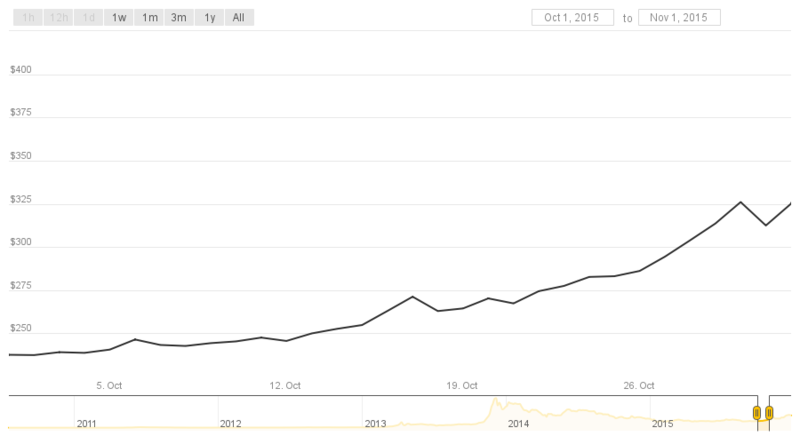 A look at the CoinDesk USD Bitcoin Price Index (BPI) from October on reveals an impressive upward arch that contrasts with the choppy peaks and valleys of the year’s earlier months. Though the exact reasons are unclear, many pundits are pinning the currency’s turnaround on the growing enterprise fascination with blockchain tech and the renewed mainstream attention from stories such as the alleged discovery of bitcoin’s founder, Satoshi Nakamoto. But as we head into 2016, a big question remains to be answered: Will recent price positivity continue to buoyed by fundamental market improvements? While only time will provide the answer, we take a look back at the price movements over the last 12 months for clues and considerations. 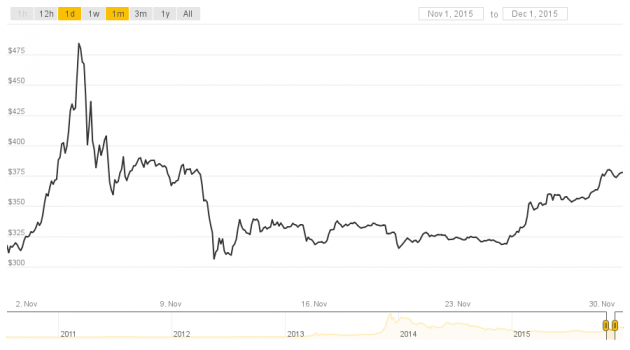 Despite starting the year at just over $300, the bitcoin price crashed to a low of around $170 on 14th January, losing 37% of its value in two days. As an example of just how sudden and dramatic the drop was, even noted bitcoin bull Barry Silbert proclaimed the market had “capitulated“. The last time the price had crossed the $200 line had been in late October 2013, before its meteoric rise to more than $1,000. The low price wasn’t bad news for everyone, however. 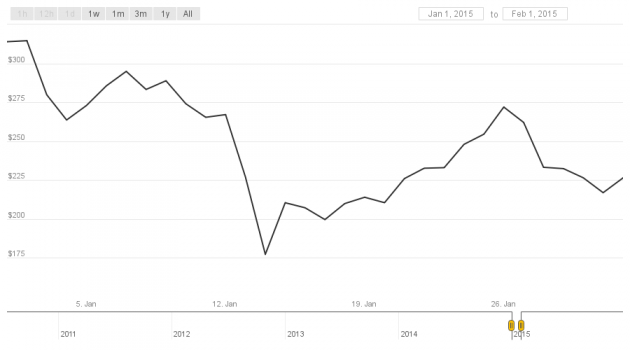 Traders got busy accumulating new positions and exchanges had their busiest day since a price rally in November 2014. 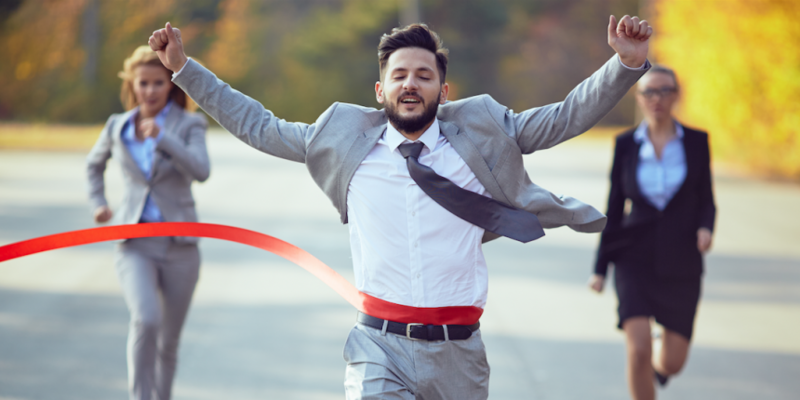 The price rebounded somewhat over the following 12 days to just over $270 and ended the month on a high note as the price rocketed over $300, seemingly at the news that exchange and wallet provider Coinbase had closed a $75m funding round. February started on a low note as Coinbase euphoria waned and the price fell back below $250. 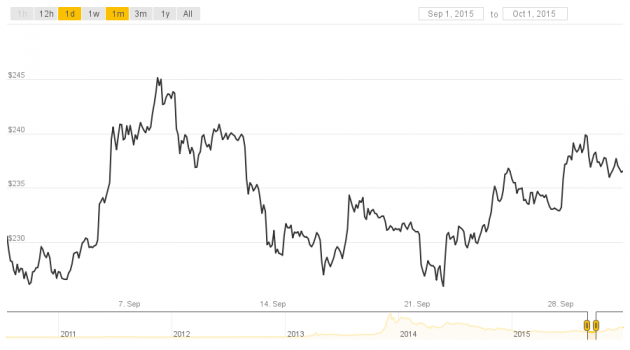 Mid-month, however, the bitcoin price gained nearly $50 in four days of trading. This represented a 23% gain over that period. Soon, as was to become tediously common, the price once again settled back below $250, undulating around $240 before a slight climb to over $250 to close the month. 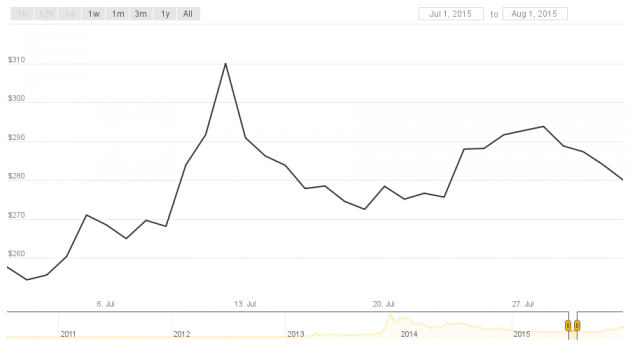 Bitcoin price gains that peaked at $286 were supported by strong volume growth early in the month. 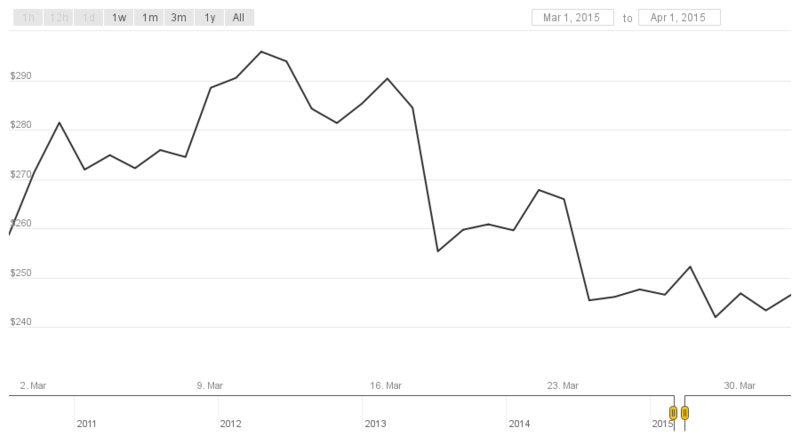 Some 3.67m BTC changed hands on the week ending 7th March, which was a 55% increase over the previous seven-day period. The second half of the month saw a reprisal of the slump to the low $200s. The above pattern was to repeat through the three months April to June, when the price generally sat level at between $220 and $240. The best one could say about the situation, perhaps, was that the notoriously volatile digital currency had “found a floor”, a positive for those who consider the digital currency a viable store of value. The development wasn’t so good for traders, of course, but many have said that low volatility is key if bitcoin is ever to go mainstream as a method of payment. 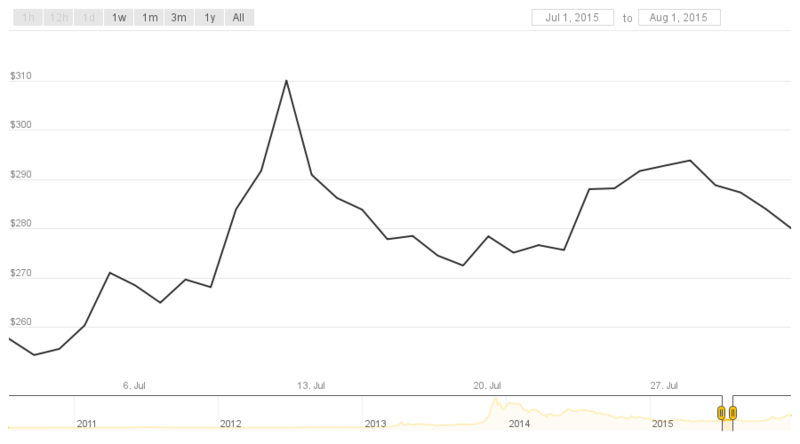 On 17th June, after months of relative calm, the price of bitcoin finally broke out of the doldrums and spiked to a high of $257. One of the most prominent theories that emerged to explain the rise was related to the market’s timing, which roughly coincided with growing indications that Greece would possibly default on its debt obligations – the ‘Grexit’, as it had been nicknamed. The fervent hope among many in the bitcoin community was that Greeks would switch to the digital currency as they saw their banks accounts frozen and ways to move money in or out, such as PayPal and Western Union, were shut off in the country while a deal was hammered out with the EU. Despite media reports selling that line, some commentators said it was just as likely that the price rise was a coincidence and the evidence for Greeks adopting bitcoin was very thin on the ground. 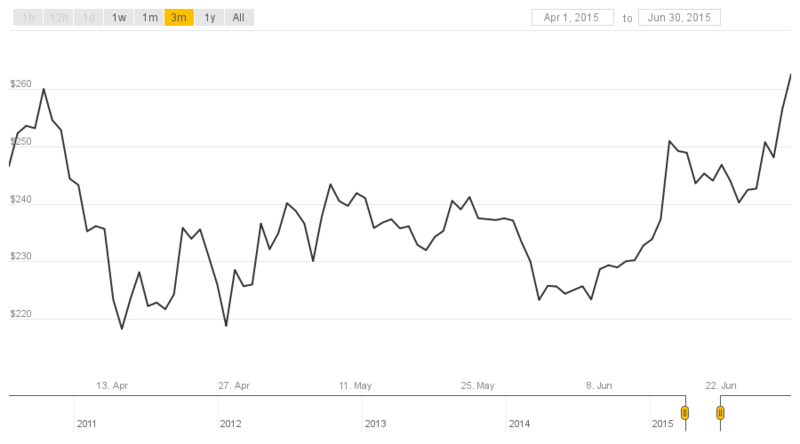 The price dropped slightly in the days after, before finishing June on a high of over $260. 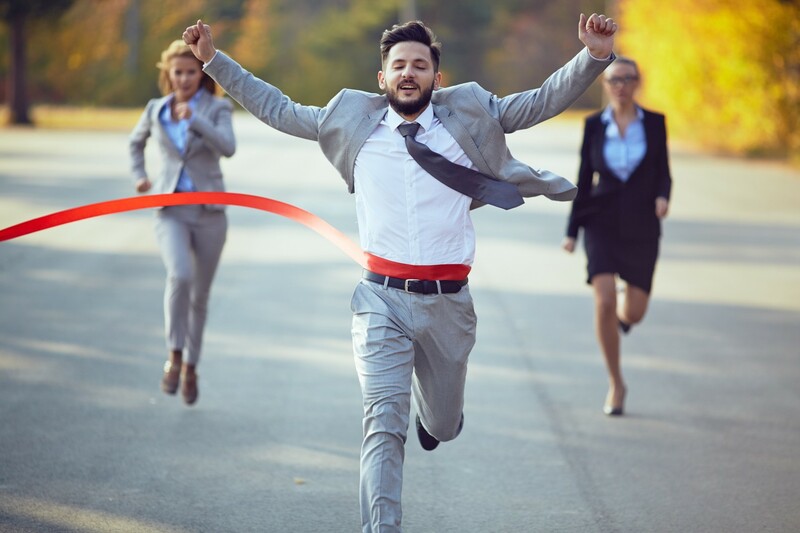 On 13th July, the bitcoin price continued to climb, shooting past the $300 mark and reaching its highest level since 10th March. Many still put the rises down to the economic situation in Greece; others attributed it to the psychological effect of people hoping for such a trend. Mid-month, CoinDesk launched a reader’s poll that concluded that some 62% of bitcoin enthusiasts believed the digital currency would be worth less than $500 at the end of this year. (While the trend is in the right direction to top $500, it’s looking like our readers were right as we go to press). After the possibly-Greek-influenced climb early in July, the price dropped slightly and spent the rest of the month around $275 to $290. A general downward price trend through the month was interrupted by two notable negative events brought about by a single bitcoin exchange. 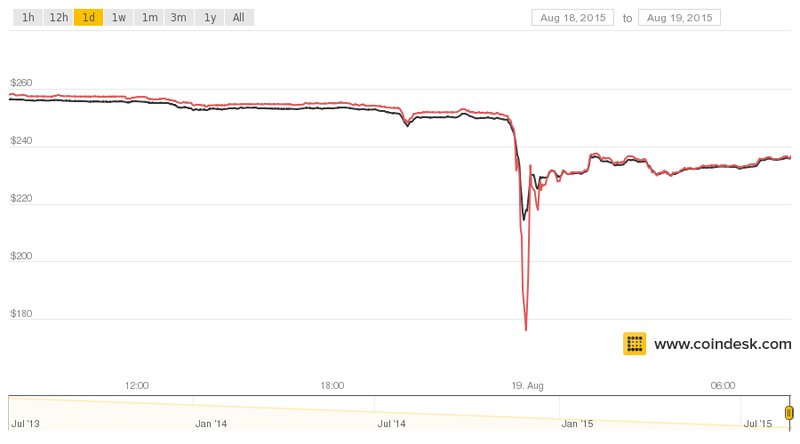 Firstly, on the 19th August, a ‘flash crash’ at Hong Kong-based Bitfinex caused the price of a bitcoin to nosedive 14% in a period of just 30 minutes. 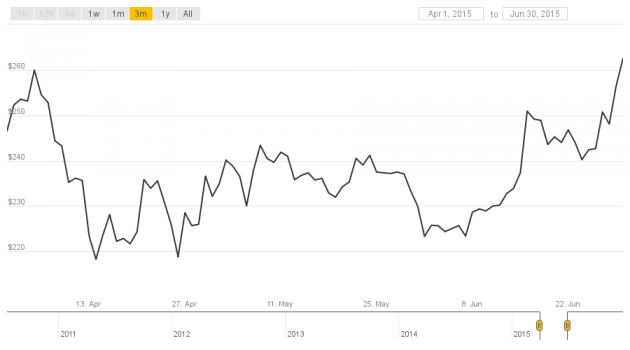 The price had been holding steady between $250 and $255, but dropped to a low of $214.36 just before midnight (UTC). 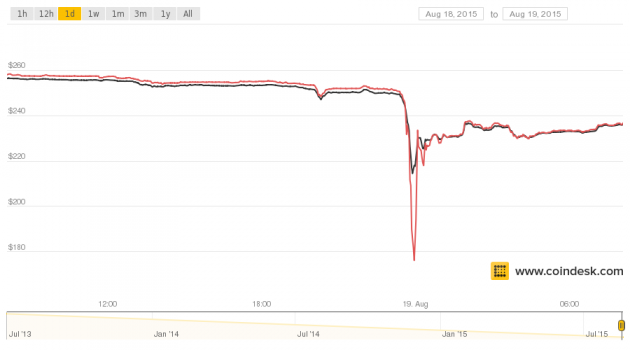 In the same period, the Bitfinex price sank 29% to $179.35. The exchange told CoinDesk at the time that the flash crash was triggered when several leveraged positions were forcibly closed in close proximity to each other. Then, on the 24th, just a few days later, the price slumped again after Bitfinex closed its order book for seven hours, citing issues with its post-trade processing. Generally uneventful, September’s prices hovered in the $230 to $240 range, with a peak at around $245 on 8th September. What was promising, however, was the signs of a rising trend towards the close of the month, though it closed at just $236. That upward trend noted at the end of September continued through October until it achieved a price of over $260 on 13th October, its highest price in two months. The raise may have been caused by a sudden surge in bitcoin trading volume driven predominantly by the Chinese exchanges Huobi and OKCoin. Bobby Lee, CEO of Chinese exchange BTCC, told CoinDesk at the time that his platform has seen a significant volume increase, though he dismissed much of his competitors’ volume as “artificial”. Those behind the volume, he said, are not traders but consumers sucked into a Russian ponzi scheme, MMM. The price trend nonetheless continued skywards and on 28th October it broke through the $300 barrier on the CoinDesk BPI for the first time in over three months. Soon after, the price was at a new high for 2015, peaking at $333.75 on the 30th. The positive trend continued into November, with the price rapidly reaching, first $400 on the 3rd, then over $480 on the 4th of the month. The sudden rise prompted Wedbush Securities to revise its 12-month projections for the price of bitcoin and revealing it expects the price to rise to $600 over the next year. After a sharp drop on the 11th that took the price back down to close to $300, it settled down to a new normal of around $325 for much of the remainder of the month, with a rise at the close to over $370. 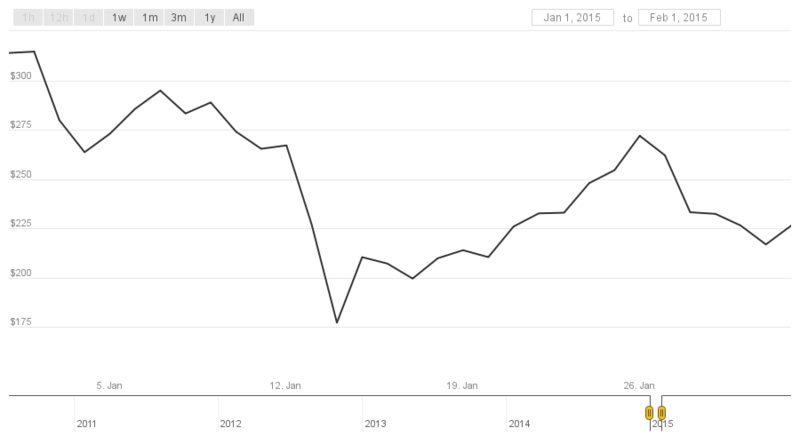 So, here we are in the closing month of 2015, and the price is trending up. 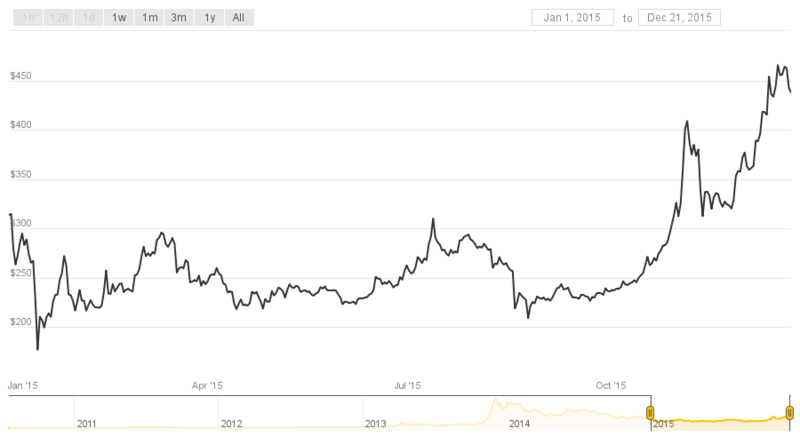 On the 15th, it reached the highest level since September 2014, climbing to more than $465 across most major exchanges. Despite a slight drop since then, pundits are enthusiastic, with many arguing the industry is poised for a positive start to 2016. 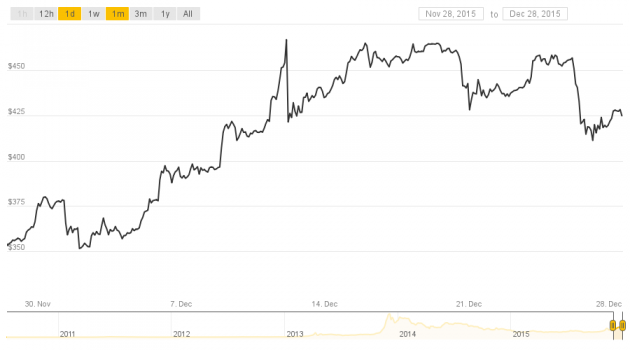 What is your prediction for the bitcoin price in 2016? Provide your thoughts below.